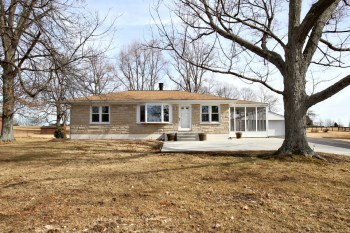 10703 Cedar Creek Rd Louisville KY 40229 is a spacious ranch in Cedar Creek. The home sits in the shadow of a few mature trees and is offered with an adjoining parcel of land, both properties totaling just under 2 1/2 acres. One acre of the land is tillable. The home also sits in close proximity to McNeely Lake Park with easy highway access. The cheery entrance includes an oversized driveway for guest parking and a large 2 1/2 car detached garage with additional storage in the back. 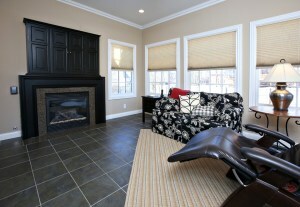 Enter into a lovely Living Room with tile floor and inviting bay window. The Kitchen has been updated and showcases built in pantry with pull-out shelving, tile flooring, abundant cabinet space, dining area, and stainless appliances. 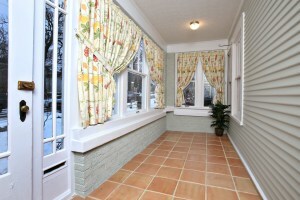 There is a relaxing screened porch located off of the kitchen. The rustic Family Room features a stone fireplace with elevated hearth and Heatilator Blower as well as a vaulted ceiling and built in display shelving. The Bedrooms are good sized with hardwood flooring, plenty of natural light, white trim, and double closets in the Master. The first floor also includes a Master and Full Bath, each with a tub/shower combo. The Basement level has another wonderful Family Room with wood burning fireplace, a Laundry Room, and another completed room to be used as an additional Bedroom (no egress). The back yard at 10703 Cedar Creek Rd Louisville KY 40229 is a park-like retreat with firepit, patio, and gorgeous views. Several other updates to the property include replacement Primax triple pane windows, new sump pump, and new eighty gallon water heater. Give us a call today at 502-371-1173 to view this property or to learn more about the current Louisville Real Estate market. 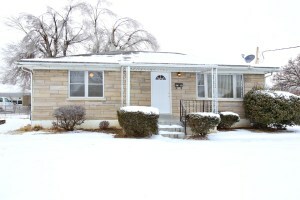 3306 Janell Rd Louisville KY 40216 is a wonderful two bedroom stone ranch. A pleasant front porch entry opens to the Living Room with plush carpeting, neutral walls, and plenty of natural light. 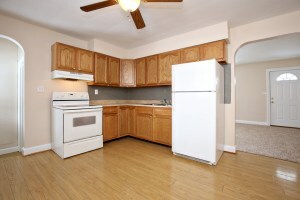 You'll love the cheery Eat in Kitchen wtih hardwood flooring and ample cabinet space. A neutral hall with hardwood flooring leads to two nice bedrooms with white trim work and ceiling fans. The Full Bath showcases a tub/shower combo and pedestal sink. The large unfinished Basement houses the Laundry area and offers fantastic storage space or room for future completion. The back yard is good sized and fully fenced. The home is conveniently positioned for easy expressway access and also includes a 2 1/2 car detached garage! The sellers are offering a new washer and dryer with an offer accepted by 2/28/2014! Call today to set up your showing of 3306 Janell Rd Louisville KY 40216 and we will be glad to provide a personal tour of current Louisville Real Estate for sale. 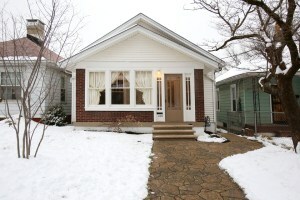 109 Stoll Ave Louisville KY 40206 is an awesome Clifton area home with tons of character throughout! The flagstone sidewalk and limestone steps add curb appeal and welcome guests into the sunny enclosed porch. 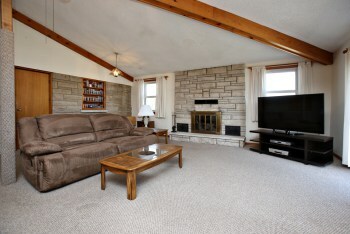 The Family Room is accented by crown molding and plush carpeting. 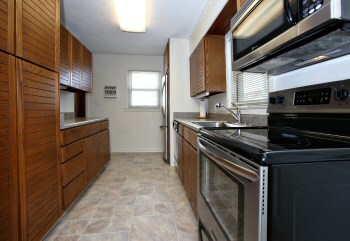 The updated Eat In Kitchen includes plenty of cabinet space, double sink, dining area, and granite counter tops! The Bedroom is good sized and positioned close to a Full Bath with granite counter and whirlpool tub. 109 Stoll Ave Louisville KY 40206 has a nice partially finished Basement with a completed room that could be used as an additional Bedroom or Basement Family Room as well as a large Laundry Room with storage space. There is additional storage space available in the attic which can be easily accessed through the Family Room. The back yard is fully fenced with a cheery deck and good sized grassy space. The roof was replaced in the fall of 2013. Very desirable location with access to shopping and dining along Frankfort as well as the parks! Call today to set up a private showing or to learn more about Louisville Real Estate. 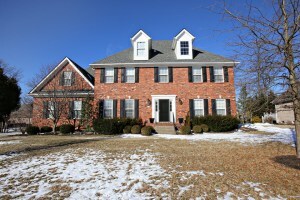 3904 Smith Grove Way Louisville KY 40245 is a gorgeous traditional brick colonial in highly sought after Woodmont. 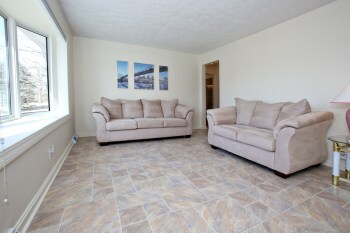 The home offers four bedrooms and a fantastic location close to recreational activities, shopping, and dining options. Understated and elegantly appointed with lovely landscaping! Enter into a beautiful Foyer with sparkling hardwood flooring. The Living Room is skillfully detailed with crown molding and french doors with a decorative transom window connect the Living Room and Family Room. 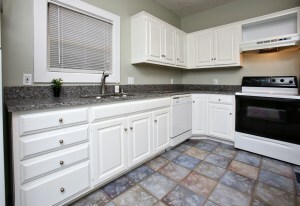 There are even additional outlets throughout the kitchen to accommodate warming dishes and plug in appliances! 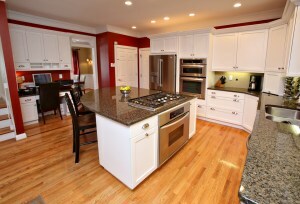 The kitchen also includes a corner drop zone with cubby shelf and cable outlet, planning desk, and pantry. 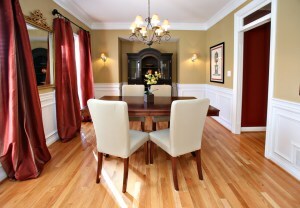 The Formal Dining Room is spacious with an attractive chandelier fixture, crown molding, wainscoting, and hardwood flooring. A Florida Room was added to the first floor in 2008 and displays a handsom ventless gas Lennos fireplace with built-in media cabinet above, heated tile flooring, and separate heating and cooling. A Half Bath for guests completes the first floor. Stainmaster carpeting has been added throughout the first and second floors of the home. The Master Bedroom is spacious with a double tray ceiling and spa like Master Bath complete with his and hers vanities, shower, jetted Jacuzzi tub, and walk in closet. 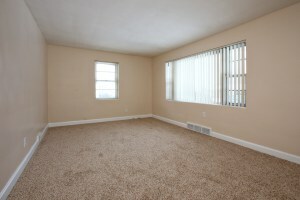 There is a large Bonus Room attached to the Master which would make a great sitting room, office, or fitness room. The second floor also contains three additional Bedrooms and a remodeled Full Bath with dual height double vanity with corian seamless top. The Laundry Room is conveniently positioned on the second floor as well- no carrying loads up and down stairs! 3904 Smith Grove Way Louisville KY 40245 has a finished Basement with comfortable Family Room, Full Bath, and an additional room which could be used as another bedroom. There is also an area for storage on the basement level. The Back Yard is wonderful for games and outdoor entertaiing. The yard is surrounded by a wood privacy fence and the Trex deck and patio offer nice gathering spaces. The deck includes a remote control awning and a natural gas line for a grill has been added to the patio space. There is even an underground sprinkler and invisible pet fence! The property offers a 3 car garage with tall ceilings for additional storage and ADT security system. New residents in Woodmont will love the neighborhood tennis court, playground, fitness room, pool, and clubhouse. Call At Home in Louisville Real Estate Group today at 502-371-1173 and one of our team members would be glad to provide additional property information or set up a private showing. You are also welcome to click on the above property link for pricing information.